I've written about the McNett Frontier Pro Water Filter previously (reviewed here: McNett Frontier Pro Water Filter). It's a terrific concept, highly useful and about 90% as useful as it can be. 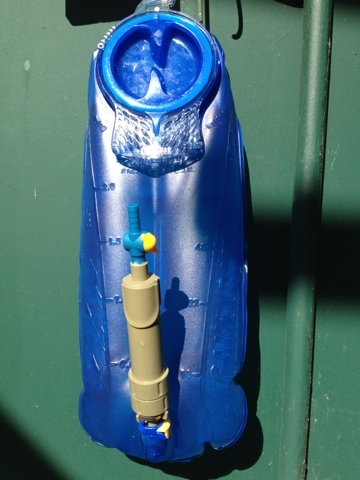 Inability to attach at the base of a Camelbak or other hydration bladder. Failure to have a replaceable filter. I couldn't do anything about #3, but with a few spare parts in my gear locker, I hacked the Pioneer Water Filter to a lighter and more useful -- 95% -- state. The following hack also works of all you want to do is attach a standard biote valve to the Pioneer Pro or would like a valve to control water in a gravity flow situation. The first stage was getting rid of the kludgy bite valve which attached to the right end of the Pioneer (below). Next was scrounging up an old Camelbak bite valve. I have a lot of those since converting most everything to Hydrolink quick connectors. As it turns out, the size of the Camelbak bite valve fitting is EXACTLY the right size to slip inside the Pioneer's bite valve attachment tube. I roughed up the outside of the Camelbak fitting and the inside of the Pioneer bite valve tube with a bit of #220 grit sandpaper. Then used a toothpick to apply a thin coating of a two-part plastic adhesive to the Camelbak end before shoving it into the Pioneer. 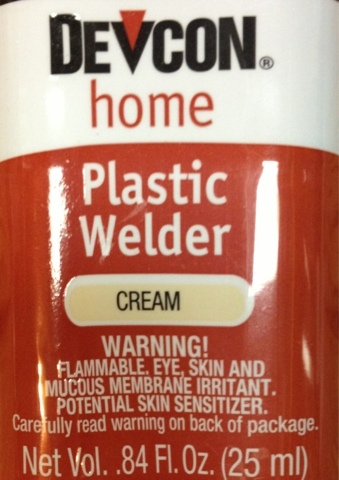 I chose the Devcon Plastic Welder because it is designed for a wide variety of differing plastics and contains a cyanoacrylate compound (think Crazy Glue) that softens/melts the plastics slightly to form a solid bond. I made sure not to get any of the adhesive near the bottom of the Camelback valve. That avoids any sort of potential blockage. Plus, the extremely tight fit means that there is negligible exposure of the water to any sort of compounds in the adhesive that you might not want. In any event, the carbon filter in the Pioneer Pro should handle that readily. I also removed the now-superfluous bite-valve protector cap from the right end of the Pioneer and the rest of the black plastic around the cylinder. 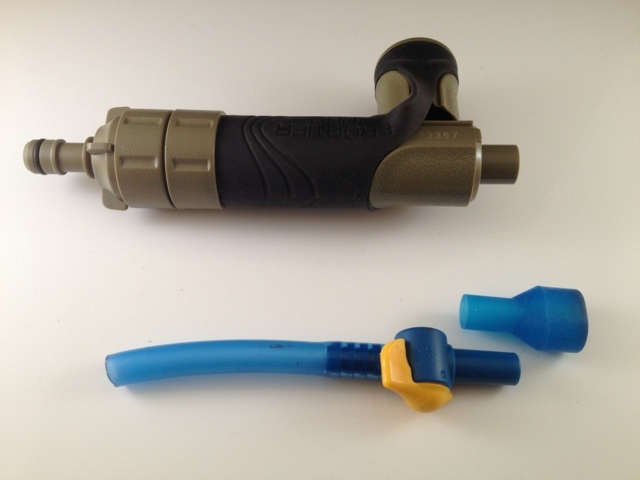 The ringed stab fitting on the re-purposed Camelbak valve fits all standard bladder tubing and that means whatever Hydrolink, bite valves and any other device. MASSIVE WEIGHT & REFILL-TIME SAVINGS! In an earlier review of the Aquamira filter bottle I noted that the MSR Sweetwater I have been carrying for years weighs 13-3/8 ounces. The hacked Pioneer Pro with the added Camelbak valve now weighs in at 48 grams (down from 64 grams, stock) -- less than 2 ounces (For the metrically challenged, 56 grams would be 2 ounces). That offes about a 12-ounce weight saving. Plus it reduces the amount of pack storage space needed. And the less space needed, the smaller the pack required ... and small packs generally weigh less than large ones. 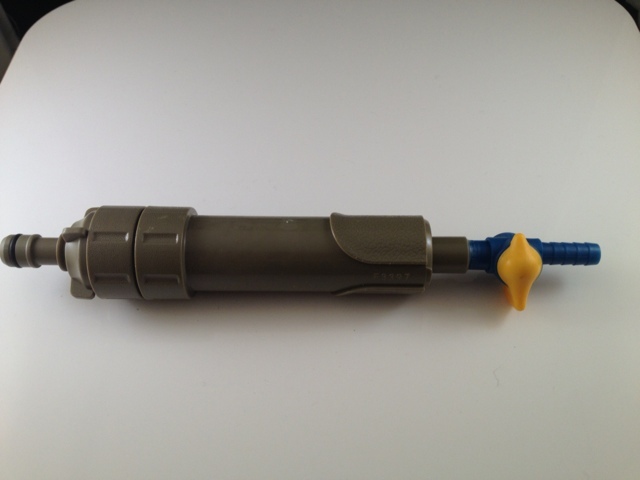 In addition, filling the a hydration bladder by dipping it into a stream saves a lot of squat time needed with a filter pump. For military personnel operating in hostile territory, that saved time can also save lives by minimizing vulnerability time. I still have a little concern about the possibility of leaks at the fitting on the Pioneer Pro's left end where the pre-filter pads go, This is a screw fitting without an O-ring. However, after letting the adhesive harden, I closed the valve on the new fitting, filled my Camelbak 100 and hung it up on the from of by gear locker to sit. So far, no leaks. If drips develop, I think that a bit of Teflon pipe tape should do the trick. As mentioned, the Pioneer Pro is now at 95% usefulness. But the lack of a replaceable filter means discarding the whole thing ... including the hacks (and bite valve fitting) that make it useful enough to leave the big filters behind. A new one will cost $20 to $25 depending on the retailer. But the hassle factor means that the true usefulness will reach 100% until the filter can be replaced. I found so many Click the Following Post interesting stuff in your blog especially its discussion. Really its great article. Keep it up. Many people have been complaining about their accounts being hacked. The problem mainly lies in the fact that hackers have been coming up with more and more cunning ways of hacking accounts. I’ll share online password generator. I will explain a few basic steps to help keep the front lines of your information safe.